Declan Costello was born in Galway, Ireland in 1967. He has a Degree in Economics from Trinity College Dublin and a Masters' Degree from the College of Europe in Bruges. 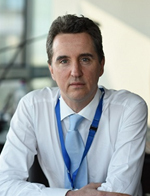 He joined the European Commission in 1991 and has worked since then in the Directorate General for Economic and Financial Affairs (DG ECFIN). He was actively involved in preparations to launch the euro, including the setting up of the Stability and Growth Pact (SGP). Following the launch of the euro in 1999, he has worked on fiscal policy issues, especially on population ageing and the sustainability of public finances. He has also worked on economic analysis on labour markets, the modernisation of social security systems and on growth policies under the Lisbon, and subsequently, 2020 strategy. He has actively been involved in economic governance in EMU and was responsible for negotiations to establish the Macroeconomic Imbalance Procedure. From 2012 to 2014, he was acting Director for Resources and Communication in ECFIN. From 2014 to September 2015 he was Director for the Economies of the Member States, covering nine Member States (Germany, Austria, Cyprus, Greece, the Netherlands, Czech Republic, Slovak Republic, Croatia and Spain) responsible for forecasting economic developments and prospects, and for monitoring compliance with the requirements of the Stability and Growth Pact and the Macroeconomic Imbalances Procedure. Since May 2014, he has been the European Commission's Mission Chief for Greece. During this period, he has led the negotiations with the Greek authorities on the design and monitoring of policy conditionality underpinning the EFSF and subsequently ESM stability programme for Greece. He was also active in the discussions that led to measures being agreed by the Eurogroup in 2016 and 2018 to ensure the sustainability of Greek public debt. Currently, Mr. Costello continues to be responsible for the Commission's post-programme surveillance of Greece.